Well, it's not really parmesan, obviously. But it's a greatttt replacement and a tasty healthy plant-based vegan alternative. I am excited to share this recipe because it's one of the easiest recipes on this page. All it takes are a few simple ingredients - sunflower seeds, hemp seeds, apple cider vinegar, onion + garlic powder, and a pinch of salt. That's it! For all my raw foodies out there - you can keep it raw... eat it straight out of the food processor and enjoy! On the other hand, you can also throw this mixture in the oven, roast it for a few minutes, run it one last time through the food processor to make the consistency really fine - and enjoy!! I love to throw this stuff on anything and everything - from pastas like this lentil pasta or this zucchini noodle pasta.. to pizzas, salads, or soups. I store my left overs in an airtight glass container and keep it in the fridge.. it'll be ready to go anytime I make a dish that pairs perfectly with a little bit of vegan cheeze on top. This creamy sundried tomato lentil pasta is delicious with some cheeze on top, and so are these zucchini noodles. Not in the mood for pasta? Try this turmeric roasted potatoes buddha bowl, and don't forget to sprinkle some of this vegan parmesan cheeze on top. 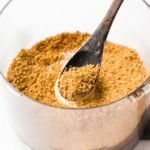 Delicious vegan parmesan cheese (cheeze) that is oil free and perfect for pastas and pizza! Raw vegan option. Gluten free. 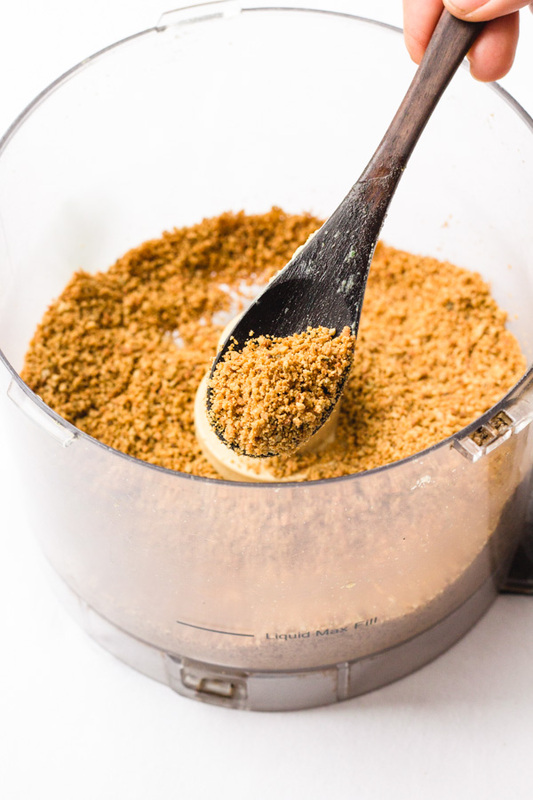 Add all dry ingredients (sunflower seeds, hemp seeds, onion powder, garlic powder, salt) to a food processor and process until mostly broken down and crumbly (but make sure not to over-process and accidentally make nut butter!!). Add apple cider vinegar to the mix in the food processor and pulse a few times. Don’t over-process, just a few pulses to combine! At this point – you can keep the cheeze ‘raw vegan’ by enjoying it as it. It’ll be soft and chewy (not really like Parmesan) but still tasty..
orrr you can roast it in the oven at 350F for 10 minutes, or until crispy and golden… let it cool for a few minutes and then throw it back into the food processor to process it one last time. This will help break down the cheeze further and make the consistency more like parmesan. That’s it! Your cheeze is ready. Store in an airtight container and keep in the fridge. Serve on top of pastas (like this lentil pasta, or this zucchini pasta). Enjoy! Quick method: Instead of turning oven on and roasting for 10 minutes, sometimes when short on time I use LOW BROIL instead and roast it for 2 to 3 minutes. But make sure to keep an eye on the cheeze when using broil because it can burn really quickly!! !